The color sensors of the SI-COLO3 and SI-COLO4 series operate with the 3-color-range method. As a light source they use pulsed white-light LEDs, the luminescence color sensors use UV LEDs. Modulation is done with 30 kHz or 100 kHz, respectively, and the lock-in-technology guarantees an extremely high insensitivity to outside light. A triple receiver for the RED, GREEN, and BLUE content of the light reflected from the target is used as a receiver. The SI-COLO3 color sensor can be "taught" up to 15 colors, whereas the SI-COLO4 color sensor can be "taught" up to 31 colors. Tolerances can be set for every taught color. In X/Y INT or s/i M mode the tolerances represent a color cylinder in space. In X/Y/INT or s/i/M mode the tolerance represents a color sphere in space. Color evaluation according to s/i M and s/i/M uses the Lab calculation method. Color detection either operates continuously or is started by means of an external SPC trigger signal. The respective detected color either is output as binary code at the 4 digital outputs (in case of SI-COLO3) or at the 5 digital outputs (in case of SI-COLO4), or it can be sent directly to the outputs, if only up to 4 colors (SI-COLO3) or 5 colors (SI-COLO4) are to be detected. Simultaneously the detected color code is visualised at the SI-COLO3 housing by means of 4 LEDs respectively at the SI-COLO4 housing by means of 5 LEDs. Furthermore, the colors can be taught by means of a TEACH button at the sensor housing. Various types of color sensors were specifically designed for the respective applications, so that for example in case of high gloss objects the color also can be detected with highest reliability by using polarisation filters (type -POL). The compact optical-fiber versions with corresponding optical attachment units (type -FIO) are ideal for applications with limited available space for installation. If, on the other hand, the application requires an operating distance of 1000 mm, this can be covered by a version with integrated optical unit and super-bright ring lighting (type -FCL). The SI-COLO-GD color gloss sensor detects both the color and the gloss of an object. The color and gloss information of an object hereinafter is referred to as a vector. A surface only is recognised if its vector data match a previously taught teach vector. With the SI-COLO3-Scope or SI-COLO4-Scope Windows® user interface, different evaluation modes can be easily selected for the color sensors of the SI-COLO3 or SI-COLO4 series. Both the raw data and the calculated color values are displayed in graphical and numerical form. Teaching can be performed with the software, with the PLC, or directly with the button that is integrated in the sensor. The color sensors of SI-COLO3-d… or SI-COLO4-d… series project a white-light spot with a diameter of approx. 1.5 mm to 50 mm (depends on sensor type) onto the object to be detected. The transmitter optics unit is located at the center of the receiver optics unit, which results in a highly compact design. This allows a high-precision and high-speed detection of small objects such as e.g. color markings or wires at a great distance. The actual color is brightened or "softened" by direct reflection that depends on the respective gloss rate of the surface. With the color sensors of the SI-COLO-...-DIL series diffuse illumination considerably reduces this gloss effect. Furthermore, the large detection range allows an optical integration of structural fluctuations, and the color is thus reliably detected with great stability. The SI-COLO-...-FCL series allows the color differentiation of objects at a large distance. Depending on the version and on the object, a distance of up to 400 mm can be realised. Among others the FCL series features super-bright white-light LEDs. The sensors of this series ideally can be employed for distinguishing between glossy and non-glossy objects of the same color (e.g. objects without and with transparent foil). With the luminescence color sensor SI-COLO-LUMI-30 series there is a sensor that apart from brightness differentiation (grey scale evaluation) also can perform color differentiation. The fluorescent objects can either be taught via the Windows® PC software SI-COLO3-Scope or via the push button that is integrated in the sensor or via the digital input IN0. In practice, the reliable detection of the color of glossy objects usually is extremely difficult because the actual color information is mixed with direct reflection resulting from the gloss effect. Rich colors thus are turned into "soft" colors. The polarisation filters that are integrated in the SI-COLO-...-POL color sensor prevent such direct reflexion, the actual color thus can be clearly recognized and reliably detected. In combination with a reflected-light optical fibre and a neutral-absorber attachment unit the SI-COLO-...-FIO makes it possible to perform color inspection of different self-luminous objects. The SI-COLO3 color sensor detects the radiation that is diffusely reflected by the target. The SI-COLO3 color sensor uses a white-light LED with adjustable power as a light source. A triple receiver for the RED, GREEN, and BLUE content of the light reflected from the target is used as a receiver. With the stepless adjustment of the integrated light source and the selectable gain of the receiver signal the sensor can be set to almost any surface. The SI-COLO3 color sensor can be "taught" up to 15 colors. Tolerances can be set for every taught color. In X/Y INT or s/i M mode the tolerances represent a color cylinder in space. In X/Y/INT or s/i/M mode the tolerance represents a color sphere in space. Color evaluation according to s/i M and s/i/M uses the Lab calculation method. All the modes can be used in combination with various operating modes, among others "FIRST HIT" and "BEST HIT". The raw data are represented with 12 bit resolution. Color detection either operates continuously or is started by means of an external SPC trigger signal. The respective detected color either is output as binary code at the 4 digital outputs, or it can be sent directly to the outputs, if only up to 4 colors are to be detected. Simultaneously the detected color code is visualised at the SI-COLO3 housing by means of 4 LEDs. With the TEACH button at the sensor housing the sensor can be taught up to 15 colors. For this purpose the corresponding evaluation mode must be set with the software. The TEACH button is connected in parallel to the input IN0 (green wire of cable cab-las8/SPS). Through the RS232 interface parameters and measured values can be exchanged between the PC and the SI-COLO3 color sensor. All the parameters for color detection can be stored in the non-volatile EEPROM of the SI-COLO3 color sensor. When parameterization is finished the color sensor continues to operate with the current parameters in "stand alone" mode without a PC. 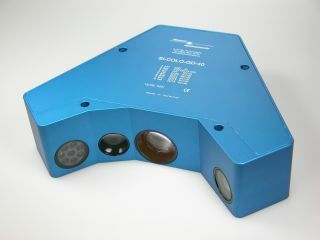 The sensors of the SI-COLO3 V6.4 series can be calibrated (white light balancing). Balancing can be performed to any white surface. A ColorCheckerTM table with 24 color fields according to CIE standard is available as an alternative, and white light balancing or calibration can then be performed to one of the white fields. The SI-COLO4 color sensor detects the radiation that is diffusely reflected by the target. The SI-COLO4 color sensor uses a white-light LED with adjustable power as a light source. A triple receiver for the RED, GREEN, and BLUE content of the light reflected from the target is used as a receiver. With the stepless adjustment of the integrated light source and the selectable gain of the receiver signal the sensor can be set to almost any surface. The SI-COLO4 color sensor can be "taught" up to 31 colors. Tolerances can be set for every taught color. In X/Y INT or s/i M mode the tolerances represent a color cylinder in space. In X/Y/INT or s/i/M mode the tolerance represents a color sphere in space. Color evaluation according to s/i M and s/i/M uses the Lab calculation method. All the modes can be used in combination with various operating modes, among others "FIRST HIT" and "BEST HIT". The raw data are represented with 12 bit resolution. Color detection either operates continuously or is started by means of an external SPC trigger signal. The respective detected color either is output as binary code at the 5 digital outputs, or it can be sent directly to the outputs, if only up to 5 colors are to be detected. Simultaneously the detected color code is visualised at the SI-COLO4 housing by means of 5 LEDs. With the TEACH button at the sensor housing the sensor can be taught up to 31 colors. For this purpose the corresponding evaluation mode must be set with the software. The TEACH button is connected in parallel to the input IN0 (green wire of cable cab-las8/SPS). Through the RS232 interface parameters and measured values can be exchanged between the PC and the SI-COLO4 color sensor. All the parameters for color detection can be stored in the non-volatile EEPROM of the SI-COLO4 color sensor. When parameterization is finished the color sensor continues to operate with the current parameters in "stand alone" mode without a PC. The sensors of the SI-COLO4 V6.4 series can be calibrated (white light balancing). Balancing can be performed to any white surface. A ColorCheckerTM table with 24 color fields according to CIE standard is available as an alternative, and white light balancing or calibration can then be performed to one of the white fields.